Running is hard. Starting to run…well, that’s even harder. Especially if you want to start running with asthma. Howdy. /wave. I’m a runner. And I have asthma. Which should tell you that those two facts are not mutually exclusive. In general, when you start to run, if you put in the time and effort, you’ll be wearing out the soles of your running shoes in no time. Just turn on something like Zombies 5k, and you’re just 8-9 short weeks away from being race-ready (and potentially willing). Now, don’t get me wrong. You might be able to run a 5k in 8-9 weeks if you have asthma. It depends on the severity and a number of factors. But most likely, it will take you longer than any training program’s prescribed length. But if you’re running with asthma, what might be a difficult task for most people becomes exponentially worse for you. Running with asthma, however, is not impossible. Lucky for you and me, though, having asthma doesn’t mean you can’t be a runner. It doesn’t mean you can get fit, that you can’t lose weight. All running with asthma means is that you have to account for your asthma. I’m living proof of that. I have a pretty severe case of exercise-induced asthma (EIA), and my typical weekly mileage before my last race was between 20 and 30 miles a week. And then, I had only been running for about 5 months. But during those 5 months, I learned a lot about running with asthma. And now, I’m okay with my condition. 1. Exercise-induced Asthma is Real. For some reason, people like to think that exercise-induced asthma doesn’t exist. Despite being diagnosed in roughly 15% of athletes, I’ve gotten a lot of flak from folks when I tell them I have exercise-induced asthma. A lot of that comes from ignorance, so you can’t blame them. People might see a 310-lb man who runs for 15-30 seconds and then has to take a 5-minute break to catch his breath, and they see a fat guy trying to exercise and failing. From their perspective, I was fat. Of course, I couldn’t run. That’s not the case, though. EIA affects way more than just obese folks. Don’t let people shame you into not taking your health seriously. Running while overweight can be tough, and running with asthma, especially EIA, is not just harder, it’s dangerous. I get being self-conscious about it, but don’t let anyone mock you so that you don’t take the way you feel seriously. If you think you may have asthma, if your chest feels tight and wheezy when you exert yourself, and you can’t quite catch your breath when you exercise, then see a doctor. Please. If you do have exercise-induced asthma, you just have to train your body and strengthen your lungs. Just make sure to keep your inhaler nearby–I keep my albuterol inhaler nearby when working out, even though I haven’t had an attack in months. 2. You ARE Different. Train Like It. A recent talk with my doctor really opened my eyes about how to approach EIA. I had been prescribed an albuterol inhaler and told only to use it when I had an attack. However, when I switched to a new doc, she told me that it was okay to take a dose before I ran, that she had a swimmer friend who did that. It had made all the difference for her. So I tried it, and it worked. It was awesome. That first day, I ran longer and could breathe better than I ever had before. The problem, though, was that I still couldn’t quite hit the intervals I wanted to. I came closer, but I still couldn’t progress as fast as some of the training programs wanted me to. And again, after a little self-deprecation, I realized that was okay. I wasn’t the program’s target audience. I’m different. I have a medical condition. In general, my rule of thumb is doubling the length of an interval training program to account for asthma. If a program or app says it can get you into running a 5k in 9 weeks, then you’re probably safe to assume that it would take an asthmatic 18-20. Don’t feel bad about that, either. You’ll get there. I did. It might take you longer to hit certain milestones than someone without asthma, but you’re overcoming a lot more than just leg aches, shin splints, and scheduling conflicts to get to the gym, you know? 3. Stop Comparing Yourself to Others. My wife and I started running at about the same time. Admittedly, she was in better shape than I was, but I wasn’t too far behind, having already lost right at 100 lbs. We both kept approximately the same running schedule, and by the time she was running a solid 2-mile interval in 18-22 minutes, I was just breaking into my first nonstop mile. And I have to admit that I was pretty bummed out about it. Here I was, in the best shape of my life, and my wife was progressing twice as fast as I was. It was disheartening. I probably got kind of pissy about it. Until I finally wrapped my head around that she didn’t have asthma. Sure, she was running twice as much as I was, but how did that affect me? So I stopped comparing myself to her and started listening to my own body. I would alter my pace based on how tight my chest felt. Some days, my intervals were 5 minutes long. Other days, they were 10. Sometimes, I had to walk a full 6 minutes before being able to jog for 2. But in the end, when I stopped thinking of myself as inferior, I was able to push through the asthma and become a runner. 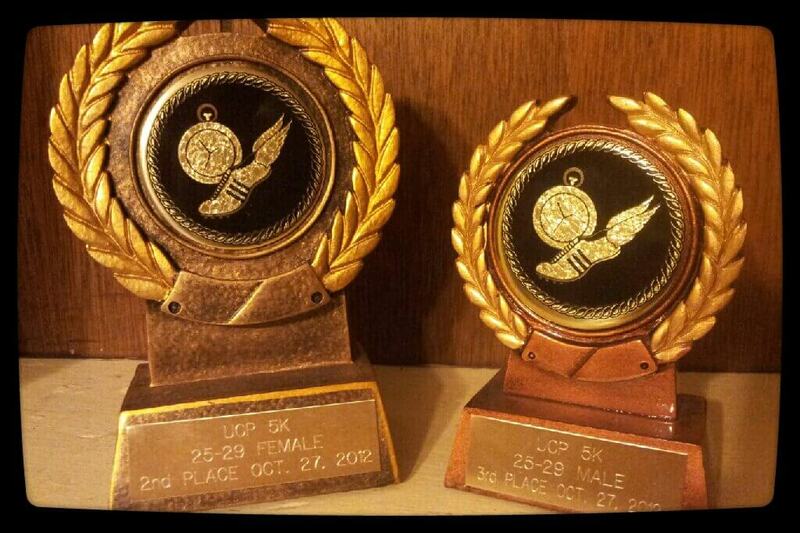 In fact, at our first race together, I ran a 27 minute 5k, while my wife did 31 minutes. It is definitely possible to be a runner if you have asthma, especially exercise-induced asthma. It’s not just a fallback excuse so fat people can get out of exercise. It’s a legitimate health condition. If you know how to train for it and take the right precautions, there’s no reason why you can’t become a runner. Sure, you might train slower than some folks. Sure, you might have to slow down and take intervals instead of solidly running for hours. And sure, you might have to keep your handy-dandy inhaler with you wherever you go. Running with asthma–and learning to live with EIA–has been one of the greatest accomplishments of my life. Dealing with it has made me stronger and more capable. I am in the best shape of my life and doing something I love despite having a major medical issue that many people think is unbeatable. Asthma is not unbeatable. I promise. Thank you for the much needed inspiration! I have asthma and I am just starting to run, and I find it very discouraging. I googled running with asthma apps and there are none. Did you use an app or a program when you started out? If it means 20 or 30 seconds at a time of running, then 3-5 minutes of walking for 20-30 minutes for a week, two, or a month—do what it takes. Running is worth it and you can do it. It does get better, I’ve been there, too.